I know everyone keeps talking up white (and judging from New York Fashion Week, that isn’t likely to change for Spring), but I’m more interested in the powder puff pink that’s stepping out this season. As predicted on the runways in January, pale pink coats, sweaters, trousers, and loafers are evidence that this Fall everyone’s looking through rose-colored lenses. It’s the pastel that’s stepping in as this year’s mint. 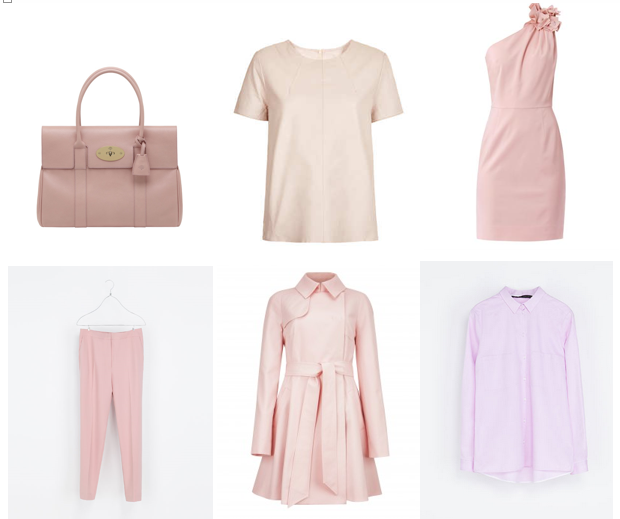 I’ve never been a fan of bright pink, but pale pink has always caught my eye–the paler, the better, so it’s just a shadow of color to soften an outfit. The one pale pink blouse I have has been adored for years, primarily because it goes with practically everything–navy, black, red, green, white, orange. It goes just as well with winter brights as it does with dark fall jewel tones. It’s like white in its versatility, but less stark and with a softness and lightness that adds a delicate touch to the steadily dropping temperatures. Plus, it’s pink. Sexism aside, you can’t wear pink and not feel pretty.